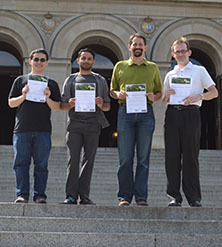 Benjamin Chung, Cyrus Omar, Jonathan Aldrich and Alex Potanin pose with their distinguished paper honors at last week’s European Conference on Object-Oriented Programming. Carnegie Mellon University computer scientists have designed a way to safely use multiple programming languages within the same program, enabling programmers to use the language most appropriate for each function while guarding against code injection attacks — one of the most severe security threats in Web applications today. Wyvern determines which sublanguage is being used within the program based on the type of data the programmer is manipulating. Types specify the format of data, such as alphanumeric characters, floating-point numbers or more complex data structures, such as Web pages and database queries. One common but problematic practice is to paste together strings of characters to form a command in a specialized language, such as SQL, within a program. If not implemented carefully, however, this practice can leave computers vulnerable to two of the most serious security threats on the Web today — cross-site scripting attacks and SQL injection attacks. In the latter case, for instance, someone with knowledge of computer systems could use a login/password form or an order form on a Web site to type in a command to DROP TABLE that could wipe out a database. Previous attempts to develop programming languages that could understand other languages have faced tradeoffs between composability and expressiveness. They were either limited in their ability to unambiguously determine which embedded language was being used, or limited in which embedded languages could be used. “With Wyvern, we’re allowing you to use these languages, and define new ones, without worrying about composition,” said Cyrus Omar, a Ph.D. student in the Computer Science Department and the lead designer of Wyvern’s type-specific language approach. Wyvern is not yet fully engineered, Omar noted, but is an open source project that is ready for experimental use by early adopters. More information is available at http://www.cs.cmu.edu/~aldrich/wyvern/. A research paper, “Safely Composable Type-Specific Languages,” by Omar, Aldrich, Darya Kurilova, Ligia Nistor and Benjamin Chung of CMU and Alex Potanin of Victoria University of Wellington, recently won a distinguished paper award at the European Conference on Object-Oriented Programming in Uppsala, Sweden. This research was supported in part by the Air Force Research Laboratory, the National Security Agency and the Royal Society of New Zealand Marsden Fund. The Institute for Software Research and Computer Science Department are part of Carnegie Mellon’s top-ranked School of Computer Science, which is celebrating its 25th year. Follow the school on Twitter @SCSatCMU.